PHOENIX — Arizona hunters still have an opportunity to receive a hunt permit-tag for select 2018 muzzleloader deer, fall turkey and youth-only javelina hunts. 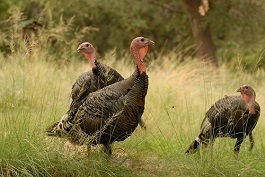 As of Friday, there were 314 permit-tags available for fall turkey in Game Management Unit 12A, 16 permit-tags for muzzleloader deer in Unit 33, and 30 youth-only permit-tags for javelina in six units in southern Arizona. All leftover permit-tags can be purchased in person with a completed application at all department offices beginning at 8 a.m. Monday, July 30. For a complete list of leftover permit-tags, visit https://www.azgfd.com/Hunting/Draw/. For more information, including license and hunt permit-tag requirements, view the “2018-19 Arizona Hunting Regulations” booklet online, or call (602) 942-3000.